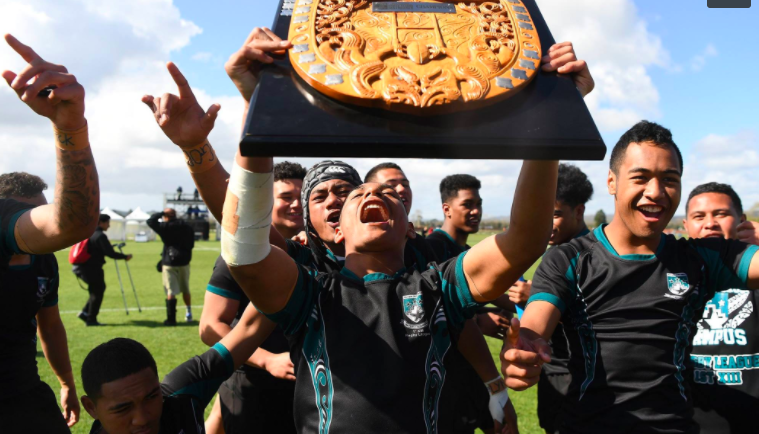 It was a third-time lucky fairy-tale ending for Kelston Boys’ High School who were crowned National Secondary Schools title winners today at Pulman Park. The boys in red finally put the heartache of 2016 and 2017’s finals losses behind them, sealing a sweet 16-14 victory over St. Paul’s College. 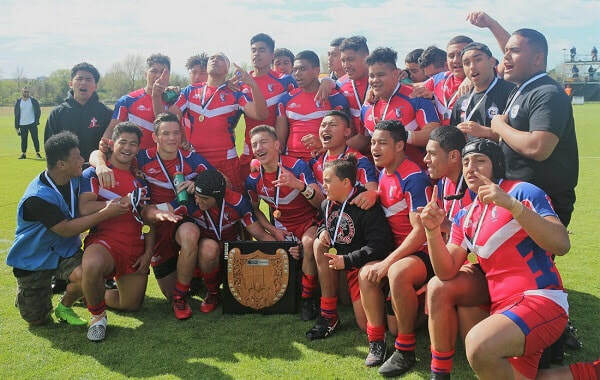 Kelston Boys' High School captain, Kadiyae Ioka was named MVP of the Permiership final and was pleased his team could get the win to round-off his final year at the tournament as a year 13 student. "For two years now we've come up against Southern Cross Campus in the final and been runners-up. This year we can finally take the shield home,"
"It's been one of the best weeks of my life. Our team have really bonded and this tournament is always an amazing experience but this one has to be the best yet," he said. However, Ioka was the first to admit the match was no easy win. After several minutes of back and forth, St Paul’s College put first points on the board, a reward for their composure and power up front in the first 10 minutes of the game. Their promising start was matched by Kelston when half Konrad Tu’a dummied to take a try for himself, which unlike St Paul’s first try, was converted successfully. Kelston drew strength from their two-point lead which was bad news for their opposition whose energy tanks were depleting by the minute. The score remained unchanged, Kelston going into the halftime break up 6-4. The second half seemed to deal blow after blow to St Paul’s as their metres gained were more often than not, doubled back by the skillful maneuvers of Kelston’s halves and wingers. St Paul’s looked set for a change in momentum only three tackles into their set when Kelston’s left winger, Raymon Tuaimalo Vaega intercepted the ball running 50 metres to touch down near the posts. A heavy percentage of possession had Kelston get across the line minutes later too, the scoreboard reading 16-4 after a successful conversion. But, St Paul’s weren’t down and out yet. The footwork of Sione Moala punched a hole in the Kelston defence to send his teammate Jonah Polota-Kopa over the chalk. Moala then converted taking the score to 16-6. Minutes away from the final whistle, the Polota-Kopa try proved to be the spark they needed. Powerhouse Antonio Aufai bulldozed through the Kelston defence to send his supporters into hysterics, all they needed now was a successful conversion to take Kelston to golden point. The unthinkable happened though – the ball bounced off the post with a sigh of relief heard from the Kelston camp. At 16-14 on the final whistle, Kelston were finally victorious. A new winner also rose to the top in the Development Grade final with Howick College defeating Onehunga High School in their final, 16-10. 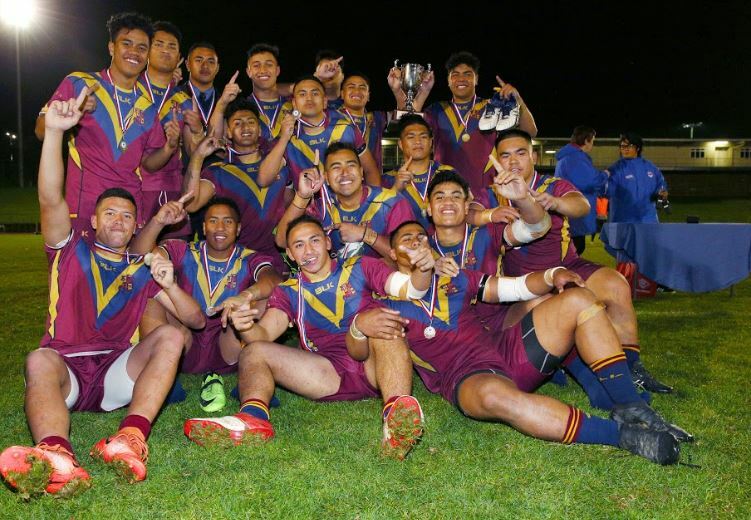 Kelston Boys’ High School are the kings of Auckland secondary school league once again, after powering past Mt Albert Grammar School 14-6 to claim the 2018 SAS College Rugby League title on Wednesday night. In the semi-finals, Kelston had beaten Wesley College 16-12 and MAGS had defeated St Paul's College 22-4. 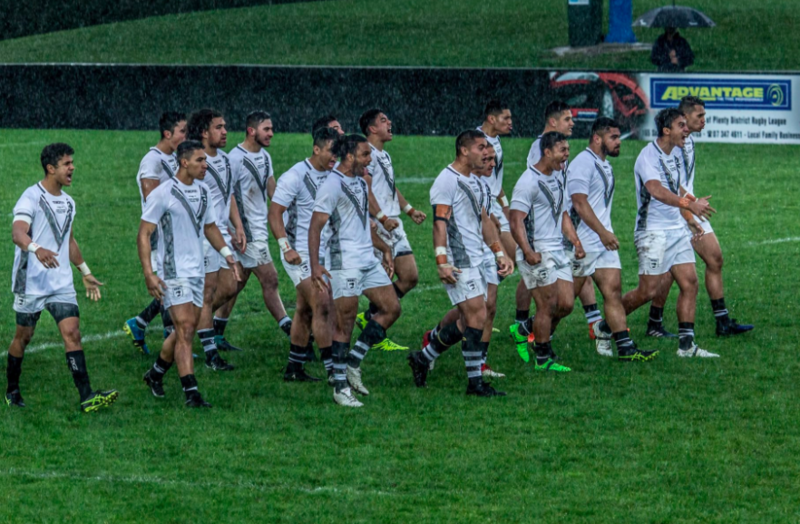 The New Zealand U18s missed out 8-40 to the Australian Schoolboys in their schools rugby league international at a soggy Trust Arena in Auckland this afternoon. In a game that promised to be a physical one, Australia snatched their second victory of the week, after beating a NZ U18 select side 26-18 earlier in the week, but this time blew the scoreboard wide open. Auckland’s wet conditions came to the party bringing countless knock-ons to both sides and handling errors that made for a slow start. The Australian Schoolboys opened the scoring after almost half an hour, when a missed tackle from the New Zealanders cost them. A conversion to Zac Lomax, the Australian centre who went into the game with a 100 percent success rate at goal from Tuesday night’s clash, took the Australian Schoolboys out to a 6-0 lead. The sheer speed of the visitors’ play the balls had them gaining 40 metres with a tackle count of only three, and it was that quick pace which brought in the Australian second-rower, David Fafita, for his first try of the match. The score would remain at 10-0 – Zac Lomax’ first and only missed conversion of their two-match campaign. Just as halftime was looming, the NZ 18s scored their first try with winger, Mawene Hiroti, crossing the line on the right wing – the NZ 18s go into the changing rooms trailing by 10-4. Refreshed and ready for another 40 minutes, the New Zealanders came out firing. Their second try came when they capitalised on their opposition’s dropped ball with captain, Dylan Tavita, scoring just right of the post. However, the captain didn’t manage to convert his own try falling short of levelling the scoreboard – 10-8. The New Zealand 18s may have closed the gap, but give the Australians an inch and they’ll take a mile. That’s exactly what they did as Tanah Boyd went in for his second try of the game which was then converted by Zac Lomax extending their lead to 16-8. Boyd would go on to earn himself MVP of the Australian Schoolboys side. Then came David Fafita’s second try. NZ found themselves struggling to read the play as Fafita received a fantastic cut from Boyd slipping through an absent defense taking the score to 22-8 after another successful Lomax conversion. Australia’s next try went much the same way set up by an outstanding grubber from the classy, Tanah Boyd which was taken across the line by Jesse Cronin. Lomax converting the try to make it 28-8. As the New Zealand missed tackle count increased, the Australians took full advantage with a further three more tries on the board, all successfully converted by Zac Lomax. Rewarded for their never-ending forward momentum, the Australian Schoolboys took home an impressive win with seven tries to two and a score of 40-8. Australian co-captains, Zac Lomax and Campbell Graham, credited their successful camp for their victory. “It was a tough game, their line speed was fast and aggressive but all credit to our boys – we got the job done,” they said. The Australian Schoolboys return home with two wins to nil over New Zealand 18s and New Zealand 18s Select. New Zealand U18 rugby league teams play the Australian Schoolboys in two internationals this week, in Rotorua on Tuesday 26 September and again in Auckland on Saturday 30 September. The New Zealand teams have been selected following match in the weekend that saw the NZ Residents team beat the Taurahere team (players currently playing in Australia originating from New Zealand) 28-10. The select side will play the touring Australians on Tuesday 26 September, 6pm at Puketawhero Park, while the 18s will play them on Saturday 30 September, 11:30am at Trust Arena. New Zealand Rugby League have named their New Zealand Resident 18s and Taurahere squads for their September 23 match-up. 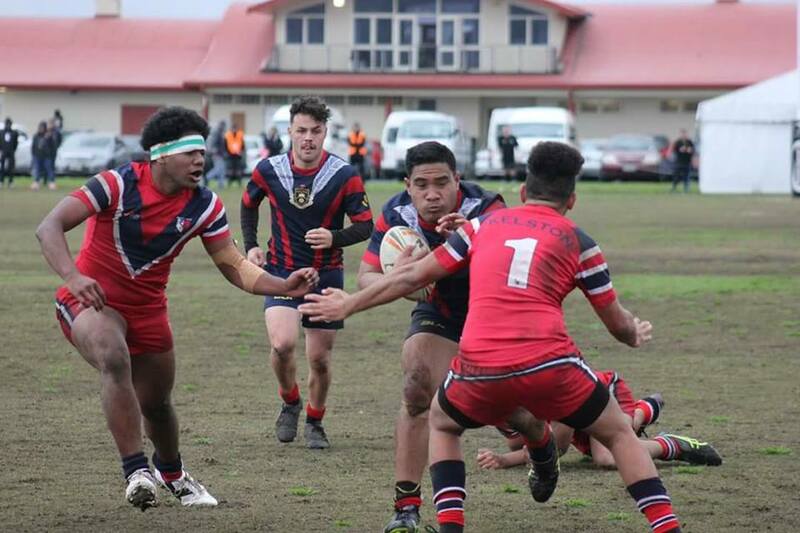 Seven of the nineteen players in the NZ Resident 18s squad, Hayze Perham, Sheldon Rogers, Lewis Sio, Javvier Pitovao, Awatere Kiwara, Nitoa Kairau and Jordan Riki, come off the back of being selected in the National Secondary Schools Tournament team last week. This young side includes seven players who are also still eligible to play for New Zealand 18s next year. The last time a NZ 18s fixture took place in 2015 the NZ Resident 18s were defeated by the Australian Schoolboys in both encounters. This year presents the first opportunity for players at 18s level to wear the black jersey. The selection for this team will include not only the best of those residing in New Zealand (NZ Residents 18s), but also New Zealanders currently playing in Australia (Taurahere) to create a New Zealand 18s side that represents the best of New Zealand. 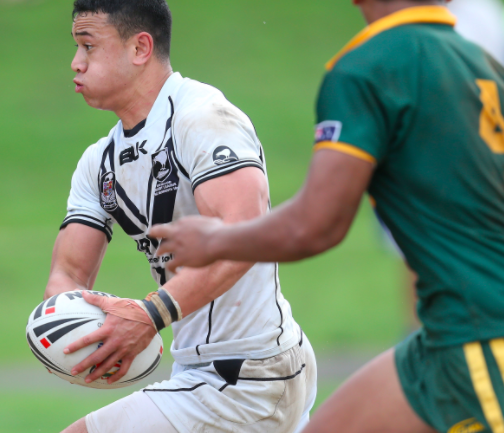 New Zealand 18s Head Coach Ezra Howe says the fixtures will further strengthen the NZRL pathways for those wanting to reach the pinnacle of rugby league in New Zealand. “This is a great opportunity for the boys to put their best foot forward playing against Australia while enjoying being in an elite environment. “Players like James Fisher-Harris who was part of the Taurahere programme when it first started back in 2014, show that these pathways provide a good foundation to then go on and represent New Zealand at the highest level. “I know this fixture will see a good standard of football being played from both teams with many talented boys to take the field. “Being a part of these programmes is just as rewarding for the coaching staff as it is for the players so I am thankful to NZRL for this opportunity,” he says. The 19-man NZ Resident 18s squad will be reduced to 18 after a full squad training camp this Friday and Saturday. Upper Central: Hayze Perham, Sheldon Rogers; Akarana: Mikey Williams, Matt Timoko, Emanuel Gerard Tuimavave, Soane Hufanga, Lewis Sio, Javvier Pitovao, Tyler Slade, Kayal Iro; Mid Central: Awatere Kiwara, Wesley Veikoso; Counties Manukau: Dylan Tavita, Nitoa Kairau, Dredin Sorenson-McGee; Southern: Seth Tauamiti, Jordan Riki, Daniel Sakisi; Northland: Paul Turner. Brisbane Broncos: Dre Ngatui-Woe; Cronulla Sharks: Fine Kula; Gold Coast Titans: Darius Farmer, Jackson Paulo; Manly Sea Eagles: Semisi Kioa, Zaane Weatherall, Keith Titums, Mark Tepu-Smith; North Queensland Cowboys: Murray Taulagi, Peter Hola; Parramatta Eels: Joseph Taipari, Oregan Kaufusi, Vallance Harris; South Sydney Rabbitohs: Mawene Hiroti, Tyrone Taukamo; St. George Illawarra Dragons: Steven Marsters; Melbourne Storm: Kelma Tuilagi; Sydney Roosters: Baylee Bentley-Hape. 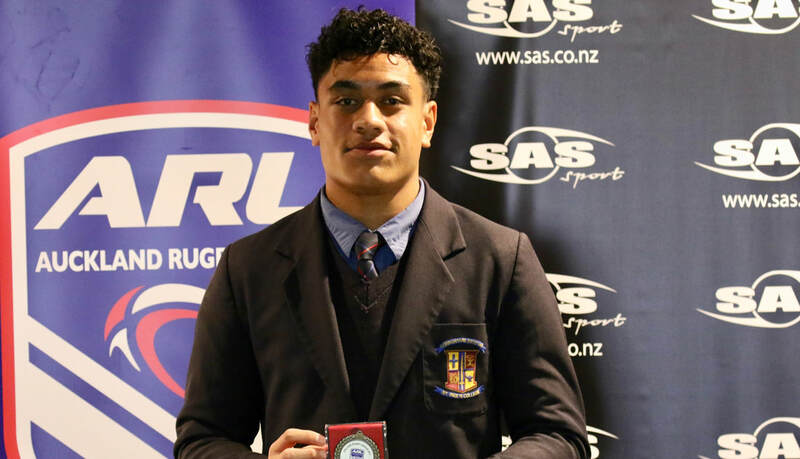 ​St Paul’s College Christian Tuipulotu has been named the 2017 SAS College Rugby League Player of the Year at the Auckland Rugby League awards breakfast this morning. The 16-year-old year 12 student has played a starring role for the school this year, advancing through to the premier championship grand final to be played at Mt Smart Stadium #2 this Wednesday August 16 (7.00pm kick-off). Tuipulotu was also awarded second rower of the year in the SAS College Rugby League 1st XIII Team of the Year. "I'm really enjoying the college competition this year," said Tuipulotu. "There's a lot of history behind St Paul's - especially playing rivalries Kelston Boys' in the grand final - so I'm sure it will be a good game this Wednesday." ​A valued member in his second year of playing for St Paul's 1st XIII team has seen him embrace the vice captaincy role for 2017. Other accolades include being named in the under 16s NZ Merit Team (2016) MVP for the National Youth Finals (2016) and captain of the under 16s NZ Resident Team (2017). He is also part of the Vodafone Warriors' Development which has seen him train with the under 20's side. Junior Fiu from St Paul's College was awarded Premier Coach of the Year for the second year straight, while Wesley's Rob Short was awarded Manager of the Year. St Paul’s centre Mike Williams who was named in the 1st XIII Team of the Year also won top try scorer with 8 tries, while Jaelin Murray took home top goal kicker with 24. 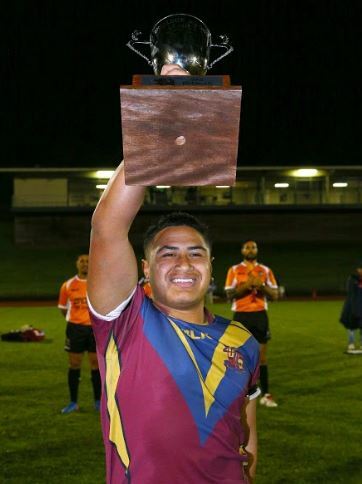 Konrad Tu'ua from Kelston Boys' was awarded top points scorer with 54. Southern Cross swept the major awards in the Senior A competition with Damien Murgatroyd winning top try scorer (5 tries) and Ropati Tupai winning top goal kicker (14 goals) and points scorer (38 points). Sir Edmund Hillary were awarded the fair play school award for the division while Jacob Tuisalegi from Pakuranga College was awarded MVP. The SAS College Rugby League Premier Championship, Plate and Senior A grand finals will be played this Wednesday August 16 at Mt Smart Stadium #2. ​Full list of winners below.